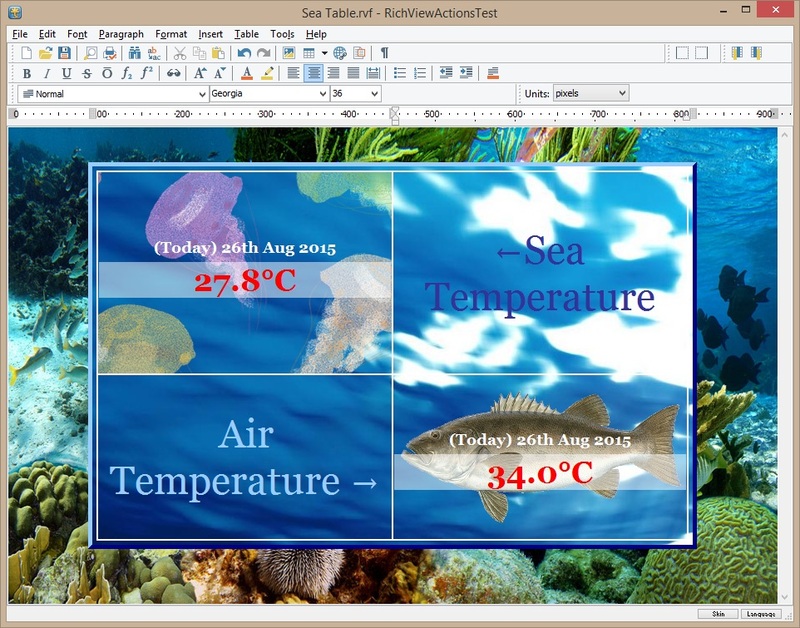 Before this version, our components processed text using functions from Windows API. Unfortunately, Windows functions for processing bidirectional (left-to-right and right-to-left) text are very unreliable: for the same text, they could give correct results for one font, and completely incorrect results for another font. So our components implemented two different set of text processing functions: with and without support of bidirectional text. Bidi-support was turned on by assigning rvbdLeftToRight or rvbdRightToLeft to BiDiMode property. Since this version, our components use Uniscribe library. If Uniscribe is not found, the components fall back to Windows API, but this situation unlikely happens: Uniscribe is included since Windows 2000 and Internet Explorer 5. Previously, if support of bidirectional text was turned off, Arabic and Hebrew text were processed completely incorrectly. Now, with Uniscribe, even with BiDiMode=rvbdUnspecified, text is processed correctly (but the proper arrangement of different items on lines is still enabled only in rvbdLeftToRight or rvbdRightToLeft modes). Uniscribe draws text using glyph indexes in font instead of character codes. 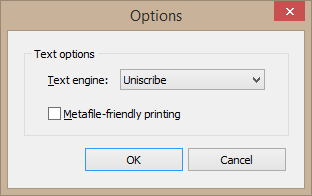 This causes problems with recording drawing output to metafiles, if this metafile will be displayed on a different computer, or, for example, used by PDF generation. To solve this problem, we implemented a special metafile-friendly drawing mode. In this mode, character positions are calculated using Uniscribe, but drawn using standard Windows functions. This mode is used by TRVPrint and TRVReportHelper components if you assign True to their MetafileCompatibility property. - you want your old document to be displayed exactly like it was before. This dialog is shown by "Tools | Options" command. Our components use Uniscribe only on the basic level: to draw and measure text, to calculate coordinates and caret positions. Line breaking and item arrangement on lines is still performed using our own procedures. Last edited by Sergey Tkachenko on Mon Sep 07, 2015 11:28 am, edited 1 time in total. - a special algorithm helping TRVPrintPreview to scale text more precisely was not run. Since this version, all these features are implemented for bidirectional text, both for Uniscribe and for Windows API. We completely rewrote our implementation of justified paragraphs. In addition to support of bidirectional text, the components format them much faster and use less memory for their processing. Last edited by Sergey Tkachenko on Mon Sep 07, 2015 2:25 pm, edited 1 time in total. In addition to left-aligned, right-aligned, centered and justified paragraphs, we implemented a new alignment type: "distribute". In justified paragraphs, text is aligned to both left and right sides by adding space between words. This alignment type is useful for Western text. However, East Asian scripts (like Chinese, Japanese, Korean) do not use space characters to separate words, so this type of alignment is useless for them. This alignment type can also be useful for Arabic texts, and for achieving decorative effects in Western texts. - new TrvActionAlignDistribute switches the current paragraph alignment to "distribute"
Since this version, the components allow to specify alignment of the last line of justified and distributed paragraphs. If a paragraph has a single line, this alignment is applied as well. - both (the same as other lines). 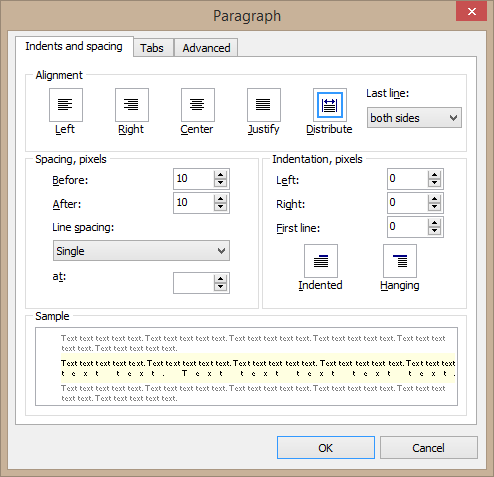 RichViewActions allow changing this alignment in the paragraph options dialog. - "both" for distributed paragraphs. Last edited by Sergey Tkachenko on Sat Sep 05, 2015 8:40 pm, edited 1 time in total. Traditionally, many East Asian scripts are written vertically, from top to bottom. 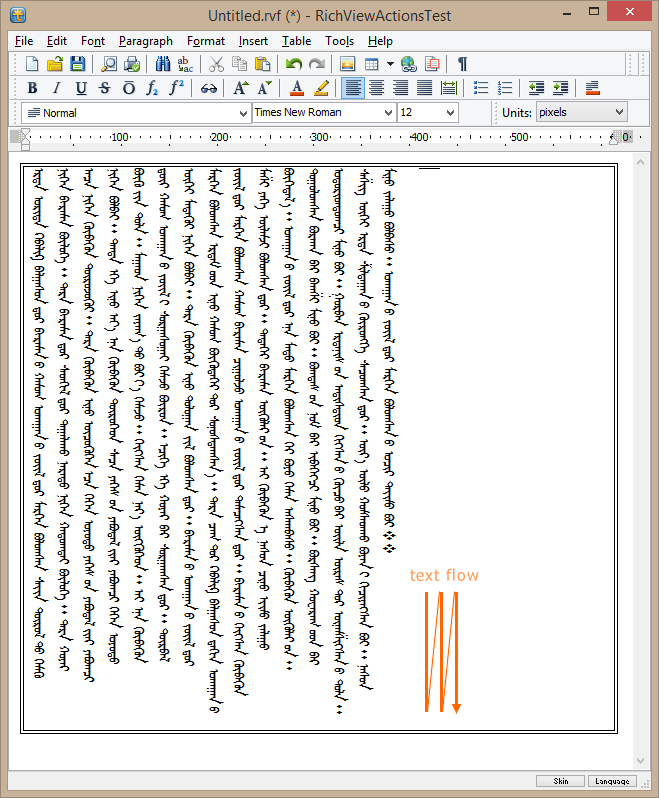 In TRichView, you can rotate text by 90° clockwise to provide a top-to-bottom text flow. To keep character orientation, one can use vertical fonts (containing characters rotated by 90° counterclockwise). 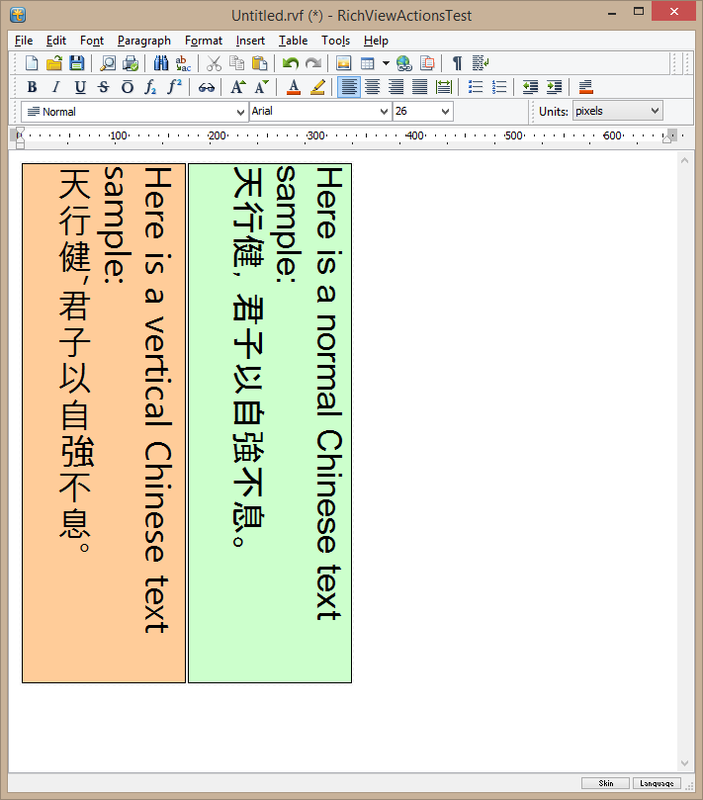 Windows includes several vertical fonts having names prefixed with “@”, for example “@Arial Unicode MS”, “@Batang”, etc. In TRichView, table cells have an option to apply such fonts automatically to text rotated vertically. Of course, instead of using this option, you can directly specify a vertical font for text. 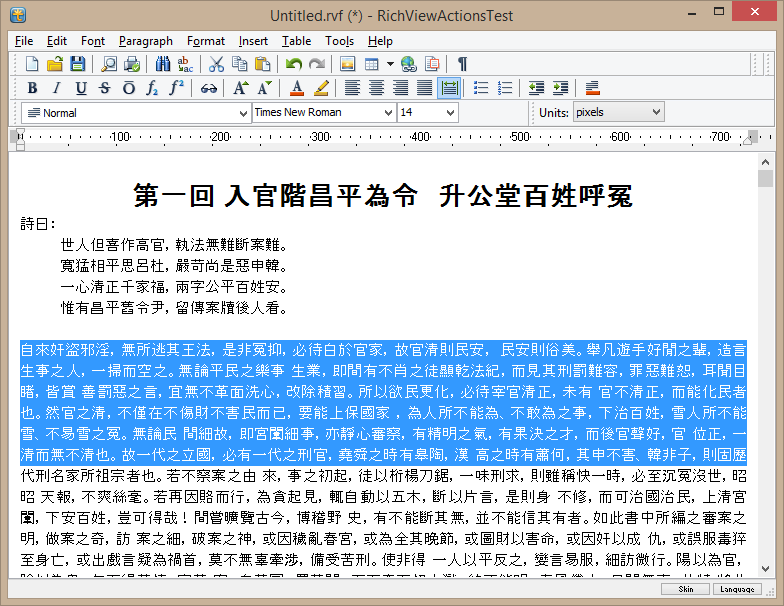 However, fonts having names started from “@” are hidden from user interface of RichViewActions, or from TFontDialog. In TRichView, table cells have an option to reverse a line order. For vertical text, it means reversing a column order. For example, for text rotated by 90° clockwise, this options arranges columns from left to right. - text boxes and sidenotes. A new property Opacity is added to these objects. It defines opacity in 1/1000 of percent. Physically, there are only 256 gradations of opacity/transparency, so this scale is obviously redundant. It was chosen for the convenience of specifying opacity in fractions of percent. 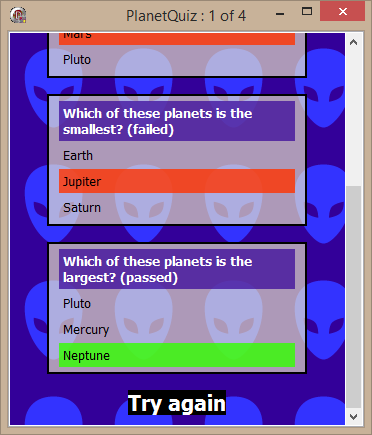 It was not too difficult to implement background transparency on the screen. Implementing printing was much more complicated, because the most of printers do not support opacity. Our components solve this problem in the same way as printing transparent pictures: transparent areas are drawn into bitmap, then this bitmap is printed. 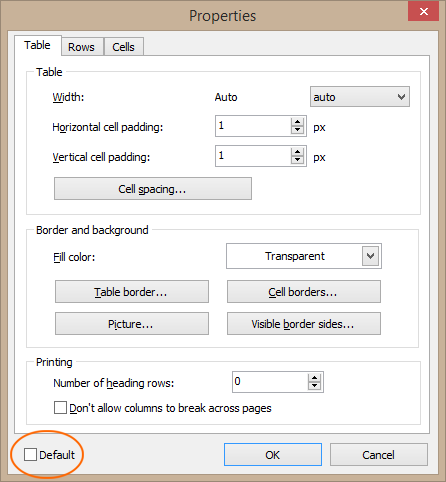 - you cannot see text boxes through semitransparent areas of the main document. - bitmaps created to print semitransparent areas are rendered in 96 dpi; so, if you can see a text fragment in such areas, it looks rough comparing to surrounding text, when printing on high-resolution printers. 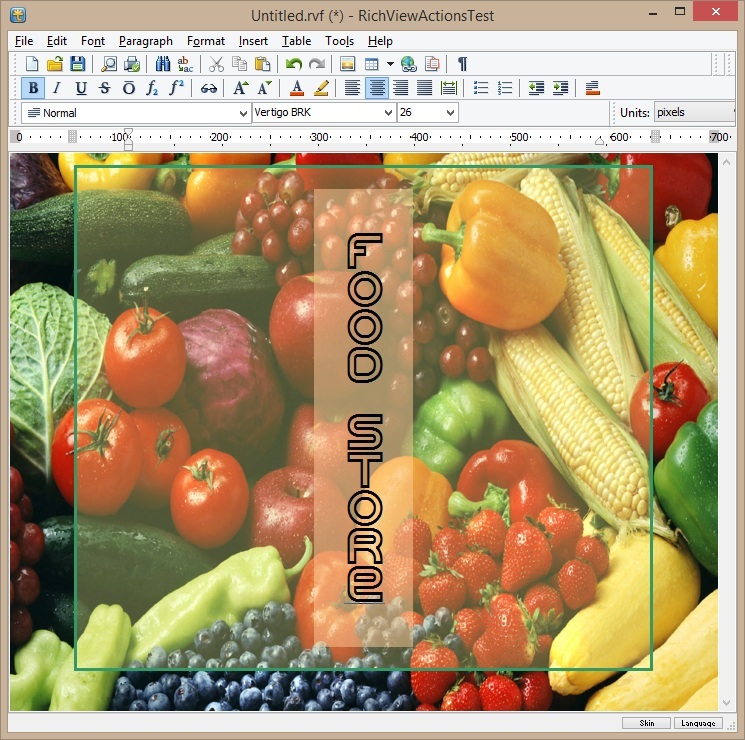 A new property is added to TRVReportHelper - AllowTransparentDrawing: Boolean. It is taken into account when drawing on the screen. If False, the component draws semitransparent areas (of pictures or backgrounds) in a temporal bitmap, then draws this bitmap. If True, it draws transparently directly on the canvas. It is recommended for drawing on bitmaps or on the screen. It's ok for drawing in metafiles, for documents not containing TPngImage images (transparent backgrounds, TGifImage, TIcon are ok in metafiles). RichViewActions are updated: opacity is added to color pickers (when appropriate), paragraph border and fill color dialogs. Last edited by Sergey Tkachenko on Mon Sep 07, 2015 2:27 pm, edited 4 times in total. 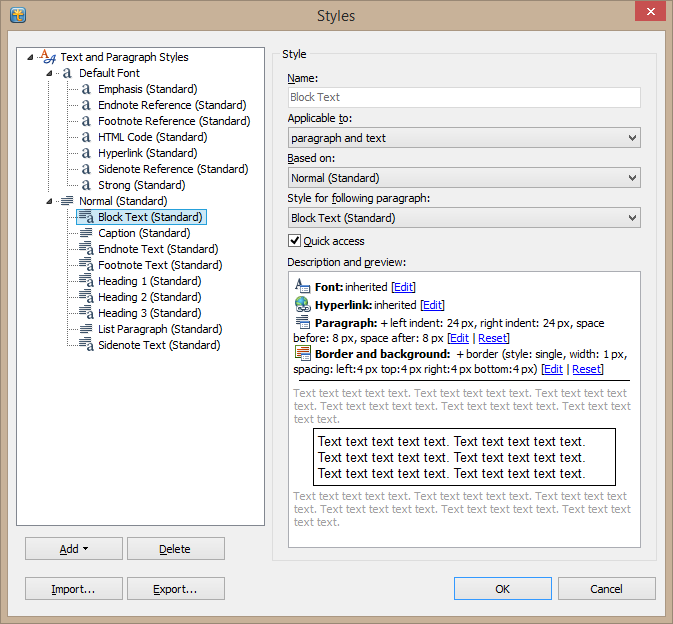 StyleTemplates in our components are similar to Microsoft Word styles (so, in this text, I will use "StyleTemplates" and "styles" as synonyms). They define both text and paragraph attributes, may define all possible attributes or only a subset of them, may be applied to text and to paragraphs, may have a parent style (to inherit properties from). RichViewActions include commands for managing, importing and exporting styles. 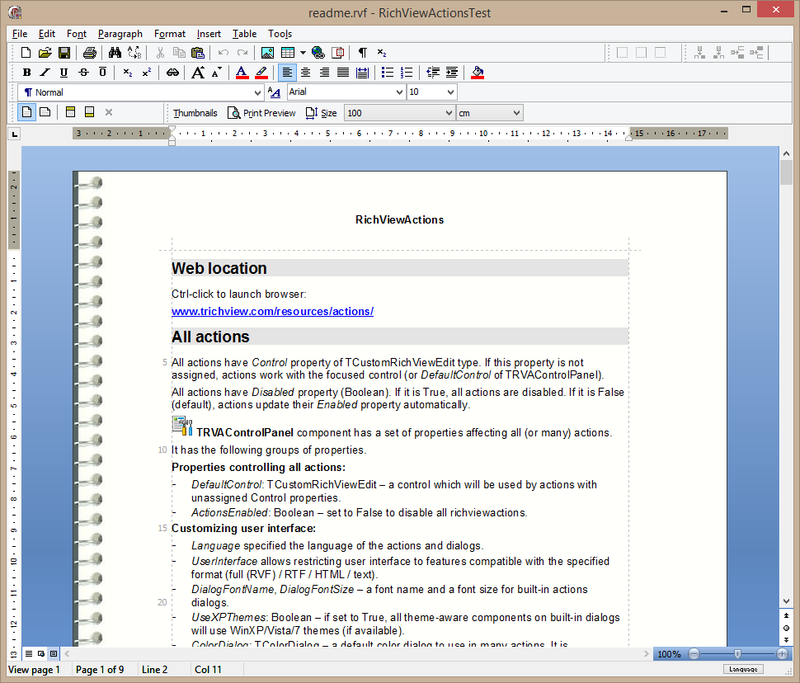 Normally, StyleTemplates are stored inside documents (in RVF format, but can also be stored in RTF and DocX). In this version, we implemented an option to store them outside of RVF files. More exactly, you could save StyleTemplates in external files even in older versions, but this function was used for export of styles, or for specifying a default set of styles for new documents. In this version we added a new option in RVFOptions property: rvfoSaveStyleTemplatesOnlyNames. If included, the components store in RVF files not the whole collections of styles, but only names of styles and information allowing to distinguish character and paragraph properties having values inherited from styles and properties defined on top of styles. So, styles can be stored externally, and will be applied to loaded RVF documents automatically. This option is useful for implementing multiple documents using the same collection of styles, for example dictionary articles or help topics. High density displays are becoming increasingly popular, particularly in mobile devices. In Windows, 96 dpi is counted as 100%. High DPI devices may have density 150%, 200%, or even more. In combination with small sizes of mobile devices, high pixel density makes non-DPI aware applications almost unusable, because if sizes of objects are defined in pixels, they become too small. By default, Windows do not allow applications to run in high-dpi mode. It draws their windows in 100% dpi mode, then stretch-draws them on the screen. After that, objects have proper sizes, but everything looks blurred and not nice. You can allow your applications to run in high-dpi mode by specifying it in their manifests. 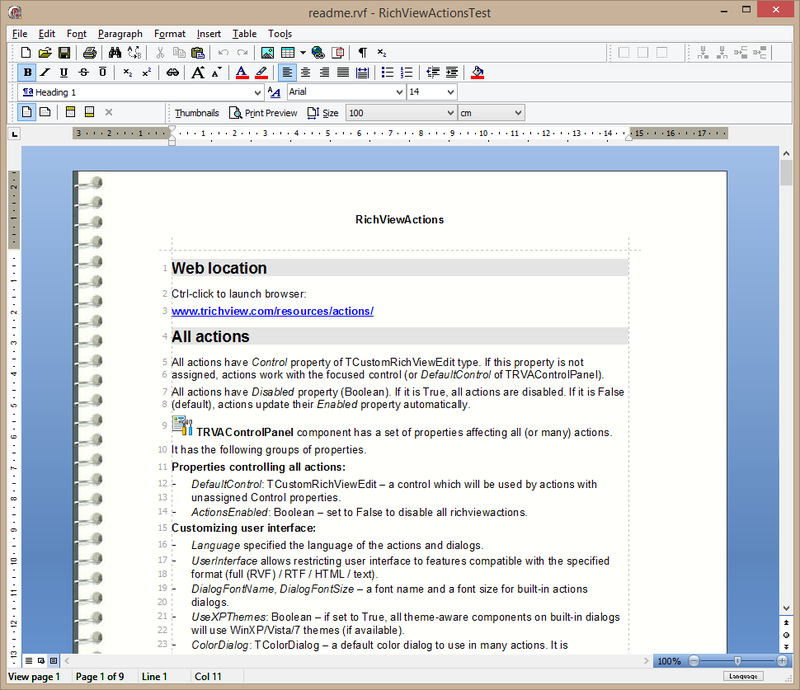 For older versions of RAD Studio, you need to provide a custom manifest. 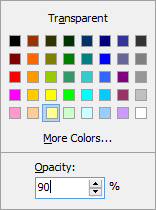 In RAD Studio 10 Seattle, there is an option for high-DPI in the project options. High dpi does not cause problems for the most objects in Delphi applications, because Delphi scales all sizes and fonts according to the screen resolution automatically. - images in dialogs of RichViewActions (only integral multiple to avoid distortion). Also, since this versions, sizes of list marker text are stored in DFM and RVF in a dpi-independent way. - "default" checkbox in the property dialogs for tables and horizontal lines; if the user checks it, the specified values of properties will be applied not only to the current table/line, but to all new tables/lines. - new TrvActionSave.DisableWhenUnmodified property. If it is set to True, "Save" command is disabled until a document is modified. - new TrvActionInsertPageCount action to insert "page count" field; "page count" and "page number" fields were introduced in TRichView 15, but until now RichViewActions included only a command for inserting "page number". Since this version, our help files are integrated in RAD Studio IDE. It became possible in RAD Studio XE8 and RAD Studio 10 Seattle, because they use a standard CHM help format. 1) You can press F1 in the code editor or the Object Inspector to get help about a type, a class or a property. 2) Our help files are accessible from RAD Studio menu "Help | Third-Party Help"
TSRichViewEdit has a new property: LineNumberProperty. A new action TsrvActionLineNumbers shows/hides line numbers. Line numbers are shown on the left margin (or on the right margin, if BiDiMode=rvbdRightToLeft). They are visible not only on the screen, they are printed as well. The main change in these demos is assigning True to MetafileCompatibility property of TRVReportHelper components. 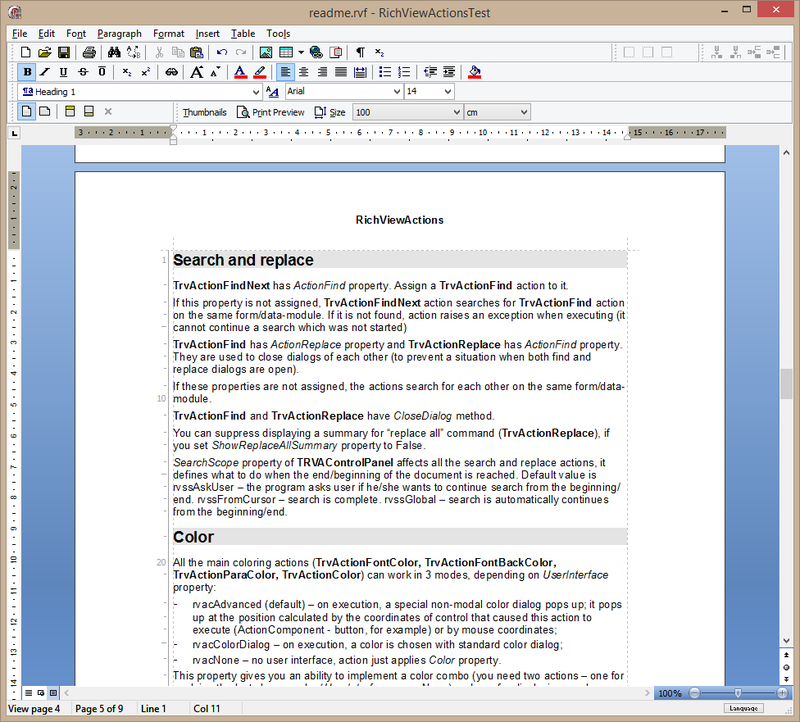 For eDocEngine, this assignment is made by TgtRichViewInterface class itself, if you use new version of eDocEngine.